'Where do the garments I put in the container go? Will they reach the needy people? ' These are the most recurrent questions when we deposit a bag with used clothing in one of the 5,100 points of collection that we have in all Spain or we deliver it in some of the stores of the Foundation. The answer is simple: these clothes are classified and prepared for reuse, depending on their quality. 49% of treated textiles are exported to several countries, mainly Guinea-Bissau and Mozambique. 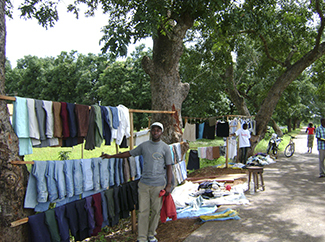 If we focus on this second country, the sale of secondhand clothes began in the 80s and since then has maintained the same objectives: on the one hand, to offer quality clothing at affordable prices to the population with less income and, on the other , To generate resources for development programs led by our local partner, ADPP-Mozambique. The way the clothing goes to the African country is as follows: the Foundation selects clothes that are more suited to the climate and tastes of the local population before being exported. They are compacted and pressed in bullets of between 400 and 500 kg, loaded in containers and sent by ship to the port of Beira, the second most populated city after the capital, Maputo. Our local partner is responsible for receiving and depositing them in warehouses or treatment centers where they are again classified (up to 72 categories or different qualities) and packaged in bales or bales of clothes of 15 kg and 45 kg, which are then sold to wholesalers . The chain ends when they market the garments in local markets. Alcina Mateus is 23 years old, her husband is unemployed and cares for the couple's young children. Sell ? ?children's clothing from ADDP-Mozambique in a small market, located behind the most modern buildings in Beira. "I started selling this dress a year ago and I already have a loyal clientele. With what I get I feed my children and I can guarantee them to go to school. I do not want them to be like me, that I could not study, "he confesses. Jorge Viegas, 48, has been selling clothes for 17 years and in all this time has created dozens of jobs. Some of your former workers are now competitors in the same market. "I do not care, there is room for everyone! ", Recognizes this veteran professional, "when I started we were three or four sellers, now we are ten times more, but there is room for everyone because people demand quality clothes and at a good price." Second-hand clothing is available to the final consumer at 24 wholesale points, spread throughout the territory. The whole process of receiving, sorting and selling) has allowed the creation of 520 direct jobs and provides a regular source of income to 6,000 vendors and more than 25,000 self-employed people in the sector. ADPP-Mozambique estimates that the number of recipients or final consumers amounts to five million and add that more than 70% has its final destination in rural areas, where people can barely access the scarce first-hand clothing stores. It provides the population with second hand clothing and good quality shoes at affordable prices. Mozambique is one of the poorest countries on the planet: its socio-economic indicators put it in the line of the states that make up the Human Development Index (in 2016 it ranked 178 out of 186). With a population of 28 million, it is estimated that six out of ten people live on less than 90 euro cents per day. It creates jobs, both direct and indirect. It allows them to generate funds for development projects, mainly in the field of education as well as health, agriculture and renewable energy. There are currently 50 projects employing more than 2,000 workers. It stimulates local trade: the surpluses they get from income from the sale of clothing are invested in agricultural production and the purchase of basic products. In addition, specific emergency assistance measures should be added in collaboration with national authorities and other non-governmental organizations. In January 2013, for example, floods in the northern province of Gaza caused more than 150,000 people to be evacuated from their homes. In coordination with the National Institute for Disaster Management, 50 tonnes of clothing were distributed from our Barcelona plant. 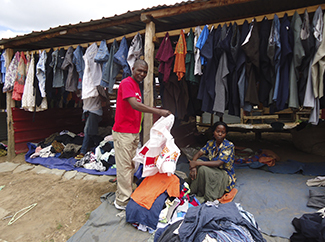 Another example: ADPP-Mozambique distributed in 2015 a total of 180 tons of clothing to orphanages, vulnerable families and rural communities affected by lack of rain or flooding. 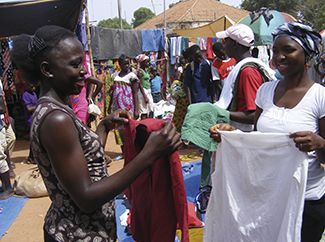 As we have seen, Humana does not make donations (except in cases of emergency), but through its local partners it sells clothing at market prices to small merchants in order to satisfy the country's demand, boost economic activity and generate resources For development. It is widely accepted among the international community that the regular donation of goods in kind to large groups of people can harm local markets and lead to psychological and material dependence. However, there are voices who say that the importation of second-hand clothing suffocates the local textile industry and livelihoods in some developing countries. A study by Oxfam Great Britain ("The impact of secondhand clothing trade in developing countries") confirms that, in countries with low purchasing power, and for the poorest citizens, second-hand clothing is the More affordable option: they can not afford more than a few new clothing items for special occasions, so they need affordable options that our local partners can provide. On the other hand, in recent years it has been noticed that many consumers prefer second hand clothing from Europe than an Asian one, even if it is new, due to the obvious difference in quality.